Our Fremont water heater repair team knows just how important a warm shower is and we want to help you keep your water heater in tip-top shape so you never have to deal with an unexpected cold shower again. That's why we suggest a full water heater inspection at least once a year to make sure your heater is running at its peak. Our Fremont plumbers offer a ten point water heater systems safety and maintenance service that covers the entire hot water system in your home. Most water heater problems come from a lack of proper maintenance. While not all problems can be avoided, they can be identified before something catastrophic happens. Take the thermostat for example, a stuck thermostat can cause your heating element or gas control valve to be stuck in an open position. This is not only a huge waste of energy, it also makes you much more likely to scald yourself on hot tap water. In addition, a stuck thermostat in combination with a faulty temperature and pressure release valve can cause the water heater to explode! The best fix for a malfunctioning thermostat is a simple replacement that usually costs under $50. Poorly maintained water heaters also show several issues with the sacrificial anode system. This is the system that prevents the interior of the water heater from rusting. A sacrificial rod is placed in the center of the tank to collect all of the free radicals in the water. These are rough oxygen atom electrons released in the heating process. The released oxygen combines with the material in the anode instead of the steel tank. This causes the anode to wear down and drop a solid precipitate into the tank. This sediment builds up at the bottom of the tank and can cause everything from poor water heating efficiency to a sulfur smell coming from the tap. The best way to prevent this is to flush the system at least once a year. 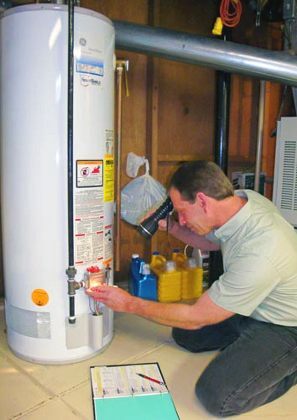 Our Fremont CA plumbing service has been working on water heaters for decades. We can quickly identify areas of your system that aren't up to snuff and get them fixed right away. One call to us and your water heater will be working safer and more efficiently than it has in years!